Villa sul Palazzo is a luxury residence on the upper floors of Villa Carrega, built in 1912 by engineer Giovanni Battista Milani for Prince Carrega. In 1955, the structure was extended to welcome the congregation of the Handmaids of the Sacred Heart of Jesus, who stayed here until the religious building became purely residential. Ramón Esteve supervised the 2017 restyling project focusing on the proportions between spaces and on the role of light and materials. 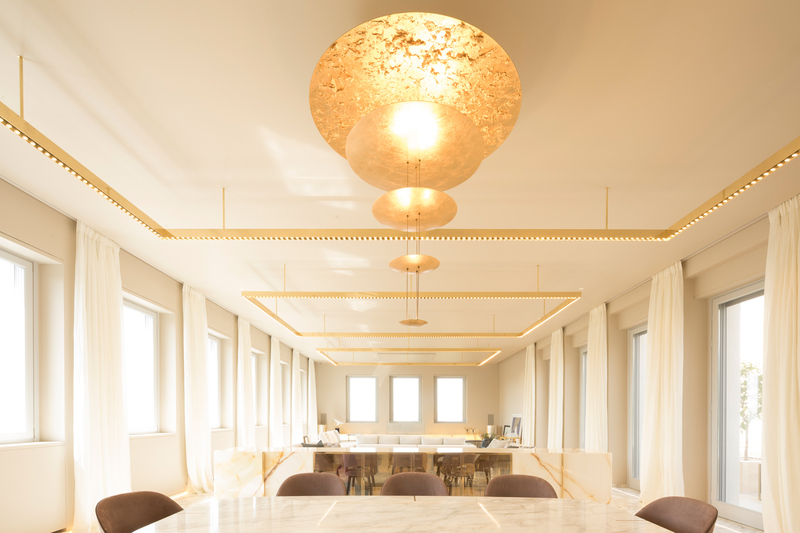 He paired classic Roman travertine and Calacatta marble with brass, giving the interiors an aura of modern luxury. The terrace features neoclassic columns, while two fountains on the sides, a central fireplace and a green area all contribute to creating a timeless, suspended atmosphere. Furniture was picked from the Casilda collection, designed by Esteve for Talenti, and features special “quick dry foam” padding, meant to endure the elements. The view over the Tiber’s valley and the Vatican is breathtaking – especially if enjoyed from the heated pool. The Villa integrates interior and exterior to perfection. Light dominates and sculpts the space. Above the large marble table in the central room is the “Light Machine” by Catellani & Smith, hand-decorated with a special gold finish that reflects the light and envelops everything with a warm and relaxing atmosphere. The main feature of the residence is a crystal elevator, which seems to magnify space through transparency. The wonderful sense of peace and quiet escalates at the top of the building’s tower: the original structure was maintained but enclosed on four sides with glass panes, turning it into an area dedicated to meditation and relaxation.